Once upon a time Kayla loved Christmas Now she s more dedicated to her job than decking the halls, and can t wait for the most wonderful time of the year to be over. Until she arrives at the enchanting Snow Crystal ski resort, determined to win gorgeous owner Jackson as a marketing client. But wooing Jackson professionally quickly turns personal as they spend flirty festive nights in this glittering winter wonderland. With snowflakes swirling and sleigh bells ringing...could Jackson be the one to make Kayla fall back under the Christmas spell? I have previously read two books by Sarah Morgan which both had two short stories in one book. I did enjoy them both but I was looking forward to reading Sleigh Bells in the Snow because it would be my first full length novel by this author. 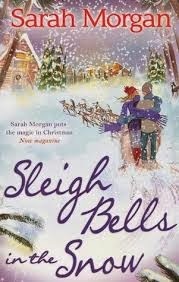 The cover is beautiful, very wintery and festive and with a lovely sprinkling of glitter! Christmas used to be Kayla’s favourite time of the year but now she does everything she can to avoid the season. The only thing that makes Kayla happy is ploughing herself into her work. The handsome Jackson enlists Kayla’s services to try and save the family business Snow Crystal, but the business isn’t the only thing Jackson is determined to save! This storyline takes place in the perfect setting for a festive read. Snow Crystal was described so well that you just want to be transported to the snowy slopes and cosy lodges with the dreamy hot tub that seems to be calling me! It was a joy to read a book where I loved each and every one of the characters there were no bad, or nasty characters which I think is perfect for festive reading, the O’Neil family were so welcoming and felt like a traditional loving close-knit family. Jackson is the perfect male lead he is strong, confident and of course devilishly handsome! Kayla was also a lovable character and at the beginning of the book there is a slight air of mystery surrounding her about why she doesn’t like Christmas and I loved that what I had in mind as to what could be the reason was completely wrong! Not all of the storyline was focused on Kayla and her problem with Christmas there was also the workings of Snow Crystal and also the other characters had their own little story going on too which is weaved into the main storyline perfectly and kept me turning those pages to see what happens to them next. Although there were a lot of characters in this book I didn’t once lose track of who was who, all the characters felt so life like and familiar.